If you have ever experienced a car breakdown or accident you will know the situation can be quite stressful. Being equipped with a few handy items can help you avoid some of the stress that comes from such situations. Carrying an emergency kit in your car may help keep you safer and calmer when unwanted and unexpected events occur. There are prepackaged emergency kits available online or from auto parts stores. However, the DIY approach can help you save a few bucks and let you be more selective about what you carry. Let’s take a look at some items you might like to include in your own car emergency kit. The user’s manual is most useful when in the car, so if you ever take it out of your vehicle ensure you return it once you have finished. If anything happens to go technically wrong, your car manual is the best and most direct answer book available. Your manual will also have instructions on how to change car fuses, light bulbs, top-up fluids, creating the best tyre pressure and so much more. Breakdowns and accidents never occur at convenient times. If you are caught out in the dark the first tool you’ll search for is a torch. While modern smartphones have built-in torches, they often use battery quickly and don’t offer a lot of brightness. Rather than drain your phone battery, opt for a handheld torch instead. If you break down on a dark road late at night, a torch can assist in signalling oncoming motorists to indicate assistance as well as danger. Every time you check your tyre pressure it’s important to make sure your spare tyre is suitably inflated as well. You should also have all the necessary items (jack and wheel brace spanner) to properly change a tyre. If you have space, include a flat and sturdy board in your vehicle. You can use that to place the jack on before use in the case of ground that is uneven or boggy. Include a portable tool for pumping up your tyres in the event you might need to reflate while out on the road. Additionally, carrying a hand-held tyre gauge to ensure you create the right pressure. Unfortunately, you cannot always rely on roadside assistance to change your tyre, especially if your phone has died or you are off the beaten track. Having a basic first aid kit in your vehicle can be helpful to yourself or somebody else if a medical problem occurs. To best utilise your first aid kit in an emergency, you may also want to complete some first aid training. Bandaids/adhesive (and non-adhesive) dressings and crepe stretch bandages of different sizes. Sterile tubes of saline solution. Hand sanitiser, alcohol swabs, antiseptic cream, and ointments made to reduce inflammation. Hydrogel, instant cold pack, and a thermal blanket. Non-latex disposable gloves and rust-resistant tweezers and scissors. Resuscitation mask or face shield for cardiopulmonary resuscitation (CPR). Water is particularly important if you are travelling to a remote area. In fact, having clean water can be a life-saver. The hotter the driving conditions, the more water you should carry. In addition to hydration, spare water is great for cleaning wounds, topping up a radiator, or impromptu cleaning (bird or bat poop). Jumper leads are a simple but extremely useful tool which you should include in your kit. For example, leaving the lights on or radio playing for extended periods of time can drain a car battery very easily. With another working vehicle in the area, jumper leads can help get your battery back up and running. Before you set up the cables read your car manual as often each model has specific guidelines on how to safely perform a jump-start. If performed incorrectly, the potential damage to your vehicle can be serious and very costly. Alternatively, you may want to travel with a jump starter pack. Effectively, this will let you jump start your car without the need for another vehicle in the area. Sometimes your car battery may not start when parked in an awkward position that make using traditional jumper leads difficult. In this case a starter pack can help get you going again. Extra fluids to top up your vehicle — small bottles of oil and coolant. A reflective triangle to warn other vehicles that your car is stopped and to make it easier for emergency services to see you. Hi-vis safety vest to wear when working on your vehicle when near a road. A compact fire extinguisher suitable for use in vehicles. You may want to include some spare cash in your emergency kit as well in the case of needing to pay for fuel (or anything) only to have your cards fail. Breakdowns can happen in any weather, so having a fleece blanket and a disposable raincoat can be extremely useful. Phones are only useful when charged, consider investing in a portable phone charger. Notepad and pencil – If you are involved in an accident, having a record of the other party’s details are extremely important. 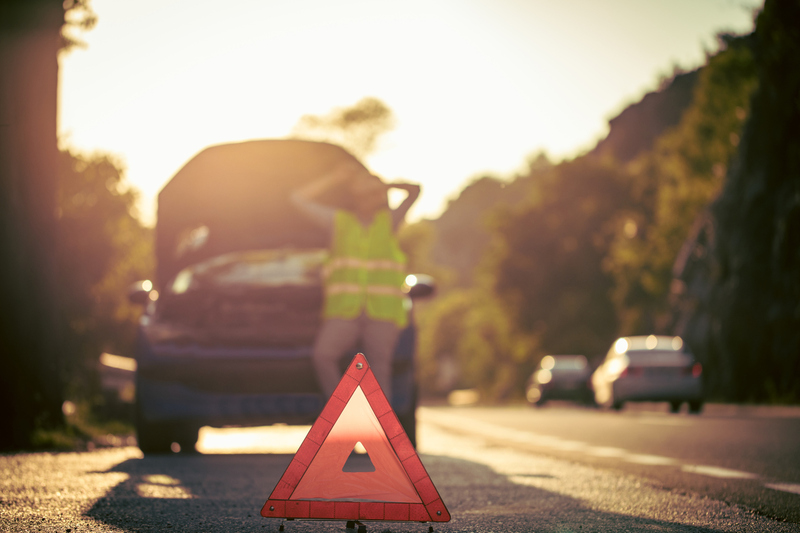 While it’s great to be prepared in case of a breakdown or emergency, it’s also smart to do all you can to avoid those situations. The best way to do that is to drive a reliable, well maintained vehicle. If your car is getting a little long in the tooth, or starting to cause some issues, have a chat with the Car Search Brokers team today. We are more than happy to help recommend and find a new car or reliable used car within your budget that meets your requirements.